Community members create a savings box to support newborns in emergencies. Needing emergency treatment to help a child is a significant burden on any parent, especially when the funds could keep them alive. Fortunately for Lin Nith, the young 27-year-old mother of Phan, 16 months old, she lives in a community in Cambodia which works together to contribute to a “Healthy Box”. This box is a collective source of funds for newborn children and parents burdened by unexpected health-related expenses. “When my son was just 20 days old he became weak, and his skin grew pale – I was so worried,” said Lin, who recalls the heartbreaking moment when her son was experiencing seizures and her grandmother urged her to take him to hospital. After a stressful and expensive journey, Lin discovered that her son had an unexpected heart condition requiring urgent surgery. She wasn’t even close to having the funds required for the surgery which would help keep her son alive. “It was an enormous expense for my family at an extremely difficult moment. I really didn’t know how to find the money to save my son – I was so nervous,” she said. That’s where the Healthy Box came to the rescue. Each month, community members contribute a small amount of money to protect themselves in circumstances that require emergency health expenses. Participants can borrow money and repay at any time without interest. Lin and her son, Phan, share a smile now he is back in full health thanks to the Healthy Box. The ‘Healthy Box’ project was established under World Vision’s Improving Maternal and Child Health (ICMI) grant project, funded by the Ministry of Foreign Affairs (MOFA) and the government of Japan. It functions in collaboration with various Health Departments and with the support of 24 health centres and 578 village health support groups. 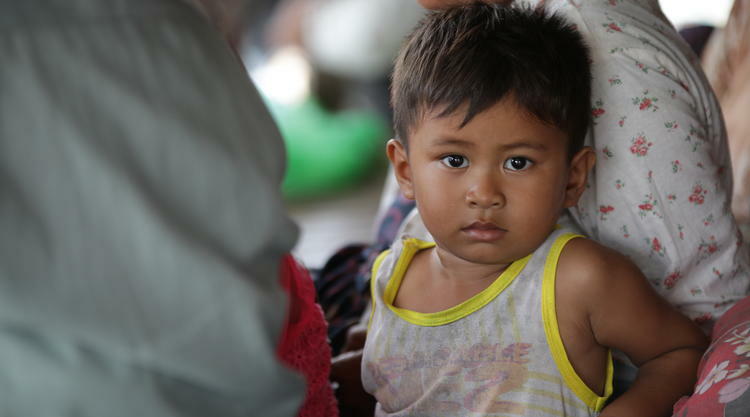 A young child sits with his mother as she participates in training aimed at reducing the rate of malnutrition. “I am happy that the Healthy Box could lend me money so easily during my crisis. Now my son is growing. He can walk, he can run, he can call for mommy and grandpa – I am so excited," Lin said with a bright smile. “I am grateful for the Healthy Box. I would also like to thank World Vision and the people of Japan for establishing the Healthy Box in my village so that my family and others like us can have a healthier life and go to the hospital in case of emergency." 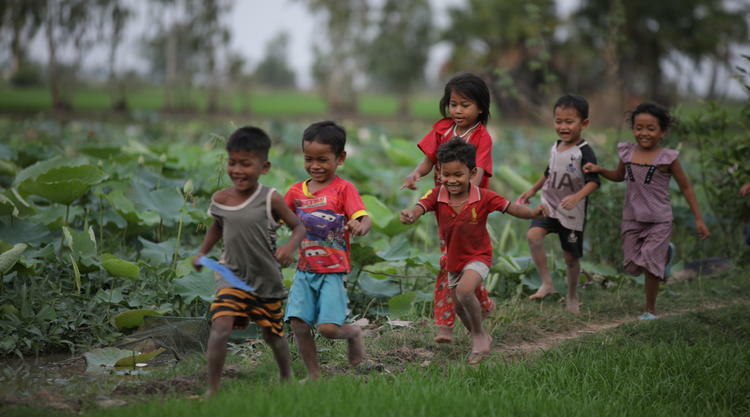 Cambodian children who are full of energy have a greater chance of being free from illness.